At what point and why did you decide to go natural? In all honesty, how tough has it been, and what's your top tip for overcoming these challenges and making natural hair work? Lawyer; Co-organizer, Naturals in the City - www.nitcnigeria.com - a quarterly natural hair & lifestyle meet-up in Lagos. With my equally hair obsessed BFF, I run The Kink and I - a natural hair blog. Been natural since 30th May 2012; being natural makes me feel Free. Creative. Like Myself. One reason or amount of money I may re-consider hair chemicals: No reason, sorry! I discovered natural hair online in 2010, while Googling for healthy hair tips to help my relaxed hair that was breaking at the time. I honestly didn’t know black/ Nigerian hair could exist outside low cuts and straight relaxed hair - sounds crazy right? I was so excited! After obsessing over photos and natural hair blogs for a long time and talking about it for hours on end, I decided that I had to at least give it a try. The hardest part was actually deciding to go natural. Almost everyone I talked to (2010/2011) thought it was a bad idea, and there were many internal struggles with insecurities I did not know I (still) had. I was in my late teens, and this conflict was a defining period in my “becoming”. After this came the second hardest - Transitioning! It took me 3 attempts to transition before I finally made it to the Big Chop. Apart from the stress of maintaining 2 different textures, I knew little about hair care so of course, I was often frustrated. Since I decided to learn my hair (6 months after my Big Chop), the journey has been good. Yes, we have our ups and downs. There are times when nothing seems to be going right, but we (my hair and I) have an understanding. Time is the biggest challenge I’m facing at the moment, but I no longer dwell on how much time I don’t have. I used to be a very “extra” natural, I am now a rather lazy minimalist one and I don’t feel guilty about it. I’m the one wearing the hair, it’s not wearing me! If you’re thinking about going natural, having a positive mindset will make all the difference. Natural hair is not hard. It’s just hard RIGHT NOW because it’s so unfamiliar. Just keep going, keep learning, and don’t put pressure on your hair to grow like anyone else’s or respond to the same products everybody else loves. Also, please feel free to grab your weave or wig or get some braids while you’re figuring out the basics. No pressure! Been natural for 11 years; Being natural makes me feel flexible, different (in a good way) and queen-like. I can't do without: I need Leave-in conditioner above all else. And coconut or olive oil. One reason or amount of money I may re-consider hair chemicals: I would NOT relax my hair again - because it seems too drastic and permanent. But maybe enough money to not have to work for the rest of my life and take care of all my family members! I have been natural for over 10 years now. I stopped relaxing my hair in 2006 because my hair was a disaster. I wasn't taking care of it at all - as a result it was thin and choppy. 2 of my girlfriends had switched to natural hair and they seemed to be doing well with it, so I decided to follow that path. I don't know if I can say it's been that tough. I think my major challenges were styling and taking the time necessary to care for my hair. Okay, taking the time is still a struggle - especially when I'm kinda lazy with it, and now I have a baby. In the beginning stages, I also didn't know that I had to put in work for my hair to thrive so I spent many years with iffy hair. To make natural hair work, you need to take care of it. Check out blogs and videos with tips on caring for your hair, and figure out what works FOR YOU! Not everything is a hard and fast rule. For instance, some people detest coconut oil, and I'm allergic to apple cider vinegar. Been natural for four years; being natural makes me feel free and proud. My hair is mine; like it literally grows out of my scalp. These things are probably taken for granted by people from other races but when you've grown up thinking your hair is severely limited, it's impossible to not feel a sense of pride in discovering just how beautiful your natural hair has actually always been. One reason or amount of money I may re-consider hair chemicals: Neither the reason, nor the word for the amount of money I'll accept have been invented yet. Interesting anecdote / funny hair encounter: Lately I've been getting these (playful, I hope?) haircut threats from different, often random people! Wow. I'd just lost a ton of hair after a failed relaxer touch up. At my mom's insistence, I googled remedies for hair loss and came upon some home remedies for strengthening relaxed hair. I tried one of those treatments and to my amazement, my hair felt better, stronger and the hair loss stopped. So it dawned on me that I could learn to care for and grow my hair by researching good hair care practices online. 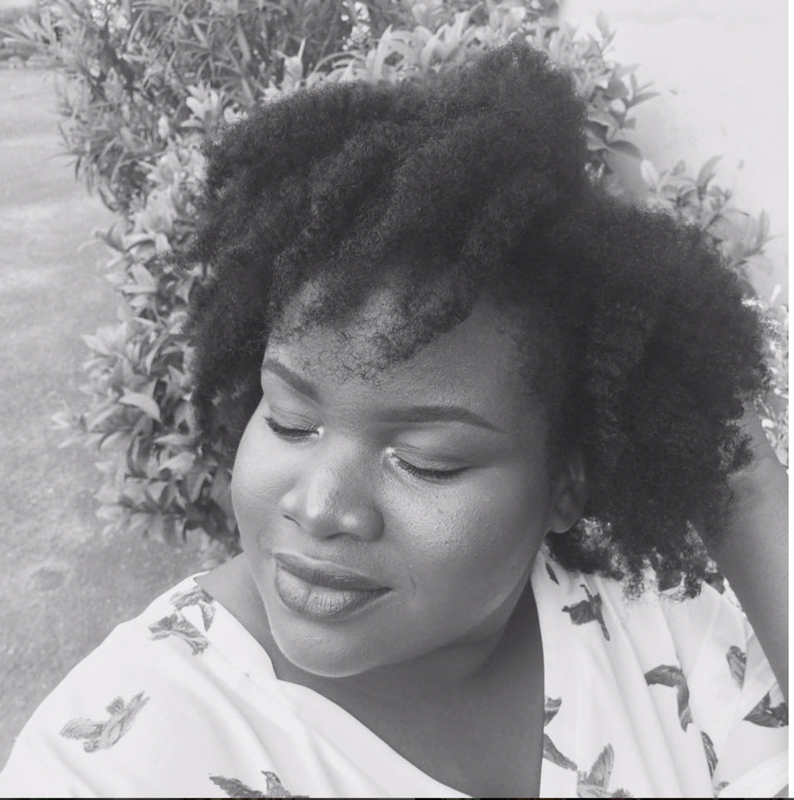 This led me to a world of natural hair like I'd never seen it before: beautiful, long and healthy; and I decided to try it out. I haven't looked back. I've dealt with a lot of hair and scalp issues (split ends, breakage, buildup, scalp sensitivity, to mention a few) since I went natural but understanding that it's a personal journey and no two heads of hair are the same, I learned to observe how my hair responds to different practices and select the ones that work for me. I also learned how to use locally and readily available natural products like oils, butters, honey and black soap when for whatever reason, the hair products I liked were inaccessible. I find that a lot of naturals struggle with styling their hair and "growth". Growth is in quotes because usually the hair is growing but for several reasons we don't seem to see it and it can be discouraging. My top tip is to stop obsessing over growth and focus on just keeping the hair healthy with good practices, such as making sure to keep it moisturized always, trimming when necessary and as the hair gets older, regular protein treatments to keep it strong and flexible. As for styling, it helps to have one or two "fall back" styles that look good on you and are easy for you to do should you find yourself in a hair pinch. Hair generally thrives when it's not constantly being manipulated. Been natural for about two years; being natural makes me free, outstanding and refreshingly original. One reason or amount of money I may re-consider hair chemicals: Only if a life depends on it. I decided to go natural after I tried a Bantu knots out on my relaxed hair. The results amazed me and I was like... "dang! girl, I need me some more volume". Since volume is a common characteristic of Afro hair, I just knew natural hair would be the way to go. The first few months were not fun because I had to cut my hair a second time at four months old for the mere fact that I didn't know what to do with it after it grew out. But it was at this point that I resolved to find answers to my questions. Although I got a third hair cut about a year ago, I can confidently say that I call the shots now. Handling natural hair is no walk in the park because some days, the hair is obedient and meek; other days, it just leaves you wondering where you had gone wrong. On days when I do not feel the need for a relationship with my hair, I do not force a relationship, I simply throw on a head wrap and go about my day for the love of me. One reason or amount of money I may re-consider hair chemicals: None. It's absolutely no benefit whatsoever. I decided to go natural on the 20th of December 2013, and this was because I saw how thick, curly and healthy my undergrowth was and loved it. Honestly, It's time consuming, emotional and expensive in a way. I guess the expensive part was my choice. Time consuming as I spend time on wash days. The whole process is lengthy. My top tips are; make a timetable for your wash day, try to shorten the process by using a 3in1 product like a co-wash, conditioner and leave in conditioner in one product; or a protein and moisture deep conditioner in one. It can also be emotional when you use the wrong product and styles don't come out right (bad hair day) or when your hair starts breaking - I can literally sit on the floor and cry. I advise you know your hair type and use what works for it, don't copy others; styling routine. Another challenge I have is availability of some good hair products in my country. I guess this is because I love to try new products that have good reviews. Been natural for almost 4 years now; Being natural makes me feel more confident. One reason or amount of money I may re-consider hair chemicals: I don't think I'll ever re-consider. My relaxed hair back then was an apology, I'm not going through that again. Interesting anecdote / funny hair encounter : About 3 years ago, I wore a Bantu knot out to a class in Uni and the lecturer walked me out saying I looked more like a patient than a nurse. I've never tried Bantu knots since then. I didn't really plan on going natural, I chopped off part of my hair on impulse one afternoon when I was alone and just went along with it from there. My head of relaxed hair was barely a handful and I wanted fuller, thicker hair. 3 months after I cut my hair, my roommate followed suit and within a year, some of my friends did the same so acceptance wasn't exactly an issue for me back then. At first my mum couldn't understand why I wanted to ditch relaxers but after seeing progress with my hair, she quickly came around. been natural for 8 years; being natural makes me feel authentic, artistic and assertive. One reason or amount of money I may re-consider hair chemicals: I've actually been considering as I'm a fan of 'beautiful beginnings. So I hope to restart the journey thereby inspiring people to join the natural community. Interesting anecdote / funny hair encounter: Once in University when I had just discovered the awesomeness of the the twist-out in a high puff, and this hall porter beckons to me and asks me, "Do you know this your hair is ugly? Why are you trying to look like Bob Marley?..." Ugh! First I didn't 'go' natural. Rather, I 'returned to' natural -via the big chop- and this was a time when natural hair was dreaded for the most part and wasn't 'hip'. I grew up in a home whereby a 'low cut' was the punishment dealt to a stubborn female child. My mother had made it a habit threatening me with that for some months so I decided to save her the trouble and also reverse the hold of power by taking a pair of scissors to my hair. Henceforth, I decided to delve into the world of curls and coils and see what it held for me. I must confess that as a newly-returned natural, I didn't know what to do to my hair or how to handle it. For all I could manage, it was from one protective style to the next. I just couldn't wait to get under the next one from a previous one. Whenever the transition wasn't fast enough, I would hide my hair under scarves - even while in the university. But then I discovered the 'fro and not to brag, but mine always turned necks not heads - yes, it was that glorious! Honestly, you have to be open and willing to learn from others. Though it will seem as though there are lots of similarities , know that no hair type, curl pattern or routine is exactly the same. Also, when gathering information, you have to be BOLD enough to experiment by tweaking the knowledge gained in order for it to fit into what your hair loves and accepts.Lastly, PATIENCE is key and I say this with a smile, because it would interest you to know that in the past 8 years of being natural, it isn't until now that I discovered the best way to moisturise my stubborn, 4c coils. Been fully natural for two years now; Being natural makes me feel very self-assured, like I was made flawless. I can't do without: (i) a heavy oil. I use olive oil or an oil mix that contains melted shea butter and (ii) any kind of mild cleanser: diluted shampoo/black soap or a clay masque - a clean scalp is important for my sanity. One reason or amount of money I may re-consider hair chemicals: I might consider a million dollars but as soon as I take the money I'm going back natural! Before I went natural, I was very familiar with natural hair and I liked it. Relaxed hair was an adventure: I just wanted hair that would hang down and not shrink. It went well for years and then I had really badly damaged hair. I discovered healthy hair care while searching on google and decided that if I could fix my relaxed hair and grow it to waist length, I would have come full circle and there'll be nowhere to go but natural. That's what I did. I transitioned for 19 months, trimming gradually, then I finally did the chop and it's been flourishing. Taking care of natural hair isn't mindless or instinctual; if not there won't be so many people offering help and even more seeking help with their hair. It takes some time and effort but not as much as some people think. Keep at it and it will get easier - both because that's how you learn your hair, and because healthy hair is easier to handle. A lot of the time I thoroughly enjoy my hair but sometimes I need a break. If I feel that way, I put it away in a protective style. That's my tip. It's like needing a little space in a relationship. Works in Finance as a communications and marketing strategist; Runs Butter by Banke (@butterbybanke), my organic products brand. I can't do without: SheaDeliciousness butter which is Butter by Banke's signature multi-purpose product. I (and almost every member of my family!) use it daily on my hair and body, as a hot oil treatment or leave-in and as a curler for twist outs. Yinka, my husband, makes me make more when we start to run low cos that's the only product he uses. So definitely my top pick. One reason or amount of money I may re-consider hair chemicals: Hmmm... maybe if I get offered £10k. I'll take the money then cut the hair and start all over. Hair will always grow back. I've had a few comments and questions from my white colleagues at work about my hair and how it just stays in one place but it's usually out of interest and from a good place. Recently, a colleague was running to get cover from the rain cos of her hair and expected me to run with her but I was simply thinking "I need this water on my hair please!" I decided to transition after I moved to London and had to pay about £100 to make my hair! I got my hair relaxed for the first time when I was about 17/18 (mum didn't let us add any chemicals in our hair until we finished secondary school). My hair used to look so good but as I continued over the years it started to lose that lustre and bounce. I really felt like I was unhealthy because my hair looked and felt unhealthy so I just stopped using chemical relaxers when I moved to London until I had the courage to chop it all off. Best hair decision ever! I couldn't find any decent hair salon where I live so I went to YouTube to learn ways to style my hair and how to crochet (life saver). So my #1 top tip: use Youtube. You can learn how to do almost anything on there. The challenging bit was getting a new style every 2 to 3 weeks, mainly because it was time consuming and I could be indecisive but I love trying protective styles out and making my own hair so it paid off. The last time I went to a salon in the UK was probably over 3years ago. The lazy side of me, however, has been stirred up cos I've been rocking my puff a lot the most part of this year. The plus side though, is that I get to wash/treat my hair every weekend or other weekend to keep it healthy and clean. If you want to leave your hair out - water to moisture, oil/butter to seal. I've had my hair exposed a lot so while in the shower I dampen it, finger comb and apply my organic hair butter. My hair has been doing alright! So much inspiration! In all of these, I love how they all advocate that hair works differently for each person and you need to take your time and find what works for you. They also highlight that in the beginning stages they had no clue (so I'm not alone!). Finally, love that you can always fall back to protective hair styles and not have your hair out all of the time! ~ ButterbyBanke will be giving away a tub of SheaDeliciousness butter + super moisturising natural conditioner to two UK residents. Leave a comment on why you'd like to win, and you should be following ButterbyBanke on Instagram. ~ Nappyhaired wigs will be offering a free wig making service to one person in Lagos (with your own weaves). To win, you should be following Nappyhairedwigs on Instagram, and leave a comment on why you'd like to win. Winners will be announced on the 9th of September! What's your natural hair story? Love it? Not for you? Need a break? Let's hair (pun intended). 9 People 1 Question: Female Travel Enthusiasts on why they (Solo) Travel; Must- see destinations and dream passports.